A couple of days ago, a bit of tragic news involving a former Cub rolled through my Twitter feed. 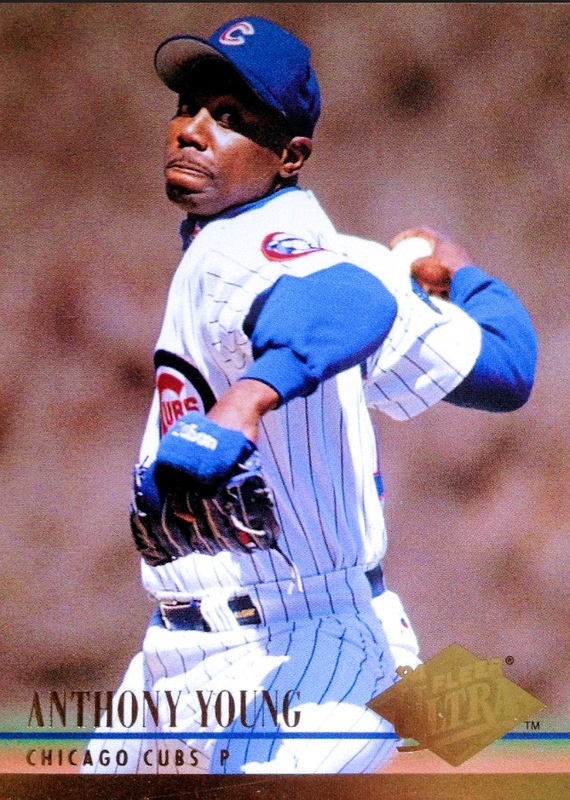 Seeing as this is a Cubs-centric blog built around the franchise's rich history of players and personalities, I felt compelled to cover it here. However, after yesterday's much ballyhooed Miguel Montero, bus-tossing incident, subsequent DFA, and the call up of Victor Caratini, I must admit that I forgot about that original bit of news and was swept up in the roster swirling hubbub. Now, with all of that behind us, it's time that I rectify this oversight. 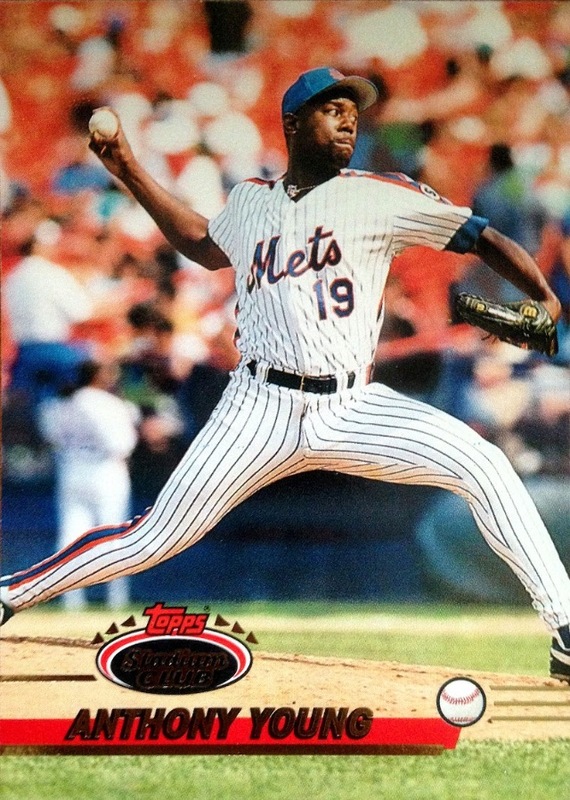 This past Tuesday, it was announced that former Major League pitcher, Anthony Young, had passed away at the far too young age of 51. Earlier in the year, we had found out that Mr. Young had been diagnosed with an inoperable brain tumor. While the always resilient Major Leaguer remained hopeful and optimistic, the prognosis was bleak. 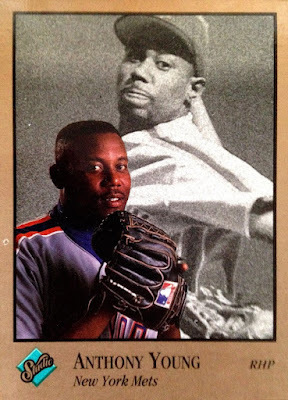 Anthony pitched in the Big Leagues for six years, two of which were spent on the Northside of Chicago: 1994-95. Those were some lean years for the Cubbies,with some especially thin pitching, but Young provided some quality innings out of both the starting rotation and the bullpen, as evidenced by his 3.87 ERA over the course of his Wrigley-dwelling stint. That said, he still posted a hard luck record of 7-10 over that same time... more on that subject later. 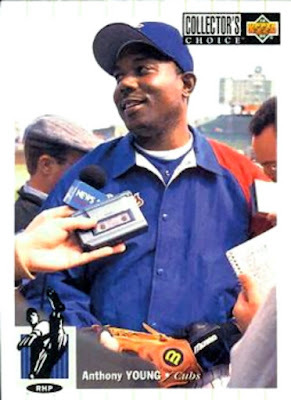 After the '95 campaign, the Cubs decided to let Young walk as a free agent and he signed with the Astros. He would finish out his career with Houston after just one more season. Injuries limited his time and effectiveness on the diamond. However, if the name Anthony Young rings a bell in your subconscious, I can almost guarantee you that it has nothing to do with his brief stints in the Windy City or the Magnolia City. Instead we have to travel all the way to the City That Never Sleeps to hear about how Anthony Young achieved notoriety in baseball. Unfortunately, it wasn't exactly for the best of reasons. You see, before Young was traded to Chicago for Jose Vizcaino, he earned a fair amount of infamy for setting the record for most consecutive losses in Major League baseball history, an "achievement" he reached while hurling for the New York Mets from May of 1992 through July of 1993. That amounted to 27 losing decisions, in a row, taking down a mark which had stood for 84 years. Yikes. Young initially came up with the Mets in 1991, winning two games against eight losses in ten appearances during his initial trial. The next year, the swingman got off to a hot start by winning two of his first three appearances; who knew that those would be his last pitching wins for well over a year? In all actuality, A.Y. is the poster boy for why pitching wins are an almost superfluous statistic, a holdover from the days of yore. After all, despite coming out on the losing side of 27 straight tilts, it's not like Young was a bad pitcher. In fact, over the course of the streak, Young had an ERA of 4.36 during that improbable span - hardly Cy Young worthy, but certainly not inflated enough to justify such dismal results. In fact, Anthony even posted 15 saves along the way, subbing for an injured John Franco. Not to mention, there was a 23 2/3 scoreless inning streak sandwiched in there, as well. Clearly, there was some bad luck afoot, which Young later recalled, "Everything that could happen, happened. It was just destiny, I guess." The fact that the Mets were lousy at that time and were especially egregious defenders didn't help either. This bad luck earned Young quite a bit of national notoriety - he even appeared on the David Letterman show to discuss his "futility." A lesser man would have broken down from all of the negative publicity and infamy; however, Young always maintained a positive spirit and his self-confined never faltered. The pressure of the Big Leagues is enough, without that monkey hanging heavily on your back, after all. Nevertheless, he kept on chugging along, providing quality innings for the Metropolitans. 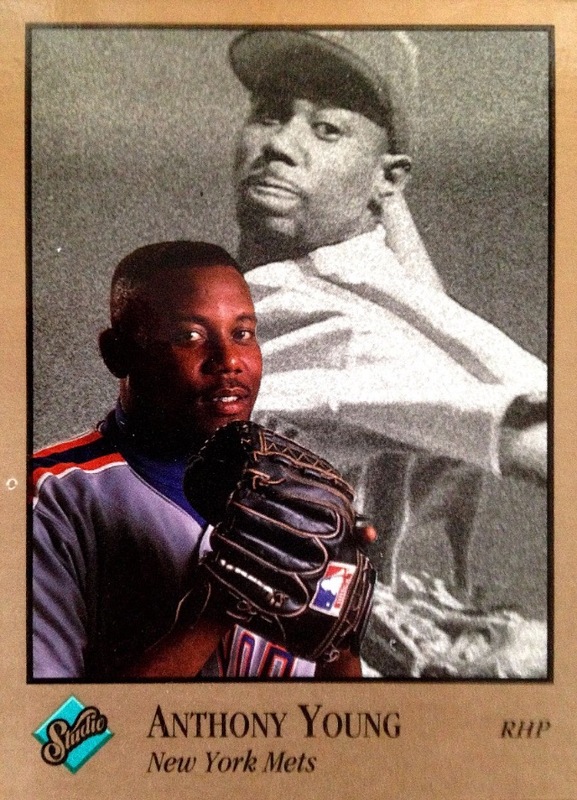 Eventually, on July 28, 1993, everything finally came together for Young and the Mets. At Shea Stadium, they broke the skid in style by pulling off a 5-4 walk-off victory in the bottom of the ninth against the Florida Marlins. Young had pitched a scoreless top of the ninth in order to earn his first "W" in 448 days. You can see the pure, joyful elation on the field and in the stands - what a way to kill a drought, huh? I figured it would make for a nice tribute to a guy who never let the negativity or pressure get him down. Although, it should be noted that the bad luck didn't stop there. In fact, Young might be among the most jinxed pitchers in baseball history - despite posting an above average 3.89 ERA for his career, he finished with 15-48, overall, with a winning percentage of .238. 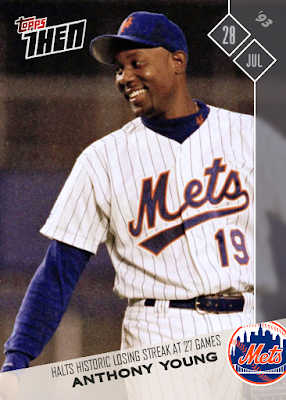 I guess pitching for the Mets and the Cubs throughout the lean 1990's will do that to your stat line. In the end, Young deserves to be remembered for much more than his streak of bad breaks - he was a productive arm and a good teammate in a couple of major markets. However, at least he will always have a spot marked out for him in the sprawling history of Major League Baseball and he turned that possibly toxic notoriety and turned it into an opportunity for personal growth. I could only hope that I would deal with such frustration as well as Mr. Young did. R.I.P. Anthony Young - Met, Cub, Astro, and role model for dealing with strife. Great work on that Topps Then custom. And yes, that's a sweet custom you made. Topps Then is a cool idea! Fantastic custom Tony, love the concept! That's a sweet custom card. Very well done. A.Y. was good people. They don't hardly make them like that anymore. In retirement, he gave a lot of himself to the neighborhood kids. I know he taught them mechanics. I hope they also picked up some concept on how to be a mensch. FWIW, A.Y. actually save 16 games during the streak--15 in '92 and 1 in '93. And he was fond of saying it wasn't a monkey on his back, it was the whole zoo. We were sorry to see him traded, honestly, and I think he wanted to stick with the Mets. But sometimes you do need a change of scenery.